The Tarot of the Ages by Mario Garizio is a multicultural deck which was created as a tribute to Atlantis, considered by some to be the technologically advanced mother of civilization. The talisman of the deck is an ankh, the cross that represents the key of life and energy in the universe of endless space. The major arcana cards depict Ancient Egypt, the society that most closely reflects the Atlantian heritage. 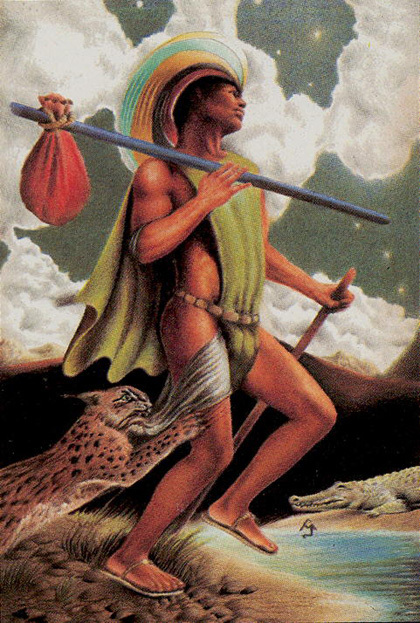 Suits of the minor arcana show 4 other societies/civilizations of the ancient world: Rods are African tribal society; Cups are Mayan, Inca and Aztec culture; Swords are Nordic Vikings; and Coins represent India.